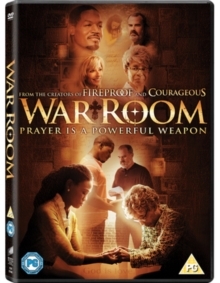 Brothers Stephen and Alex Kendrick write this poignant drama about a marriage on the brink of collapse. Elizabeth Jordan (Priscilla C. Shirer) feels like her husband Tony (T.C. Stalling) is slowly slipping away from her, going away on business trips and no longer communicating with her or their daughter. While on her job as a realter, Elizabeth visits the house of the elderly Miss Clara (Karen Abercrombie) who, sensing something wrong within Elizabeth's life, teaches her the art of prayer. Miss Clara shows Elizabeth into a small closet she calls her War Room where she writes down all her prayers and sticks them to the walls. As Elizabeth begins to pray for her husband and her marriage miraculous things start to happen.